Roughly half the world’s population still lives on the equivalent of about US$2 a day. And in too many places, having a job doesn’t guarantee the ability to escape from poverty. The slow and uneven progress made to address this requires us to rethink and retool economic and social policies aimed at eradicating poverty. The FSC certification system is a model in which the use of forest products actively contributes to sustainable economic development and thereby goal 8 of decent work and economic growth. FSC foresees that the use of wood will increase, replacing unsustainable materials such as concrete, steel, and oil. However, sustainably managed forests cannot deliver limitless volumes of resources. Therefore, waste minimization in the production process, efficient use, and the recycling of waste are necessary. All of this is supported by the FSC scheme. For example, FSC has created a special label for products made of 100 percent recycled materials, and accepts reclaimed materials as equivalent to wood from certified or controlled sources. 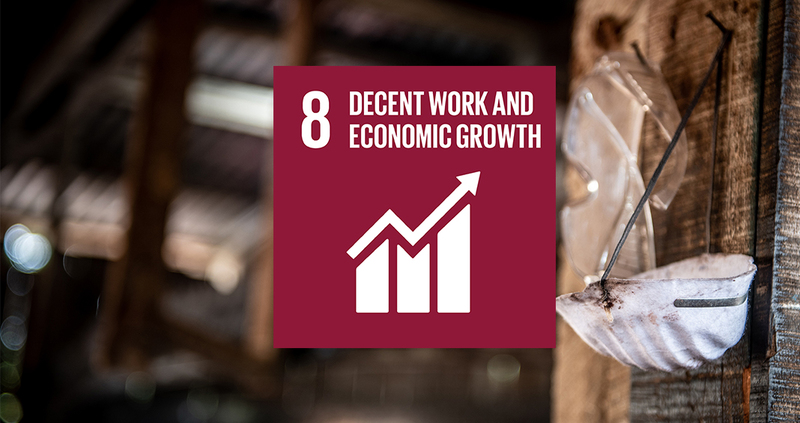 Furthermore, FSC supports the SDG targets on employment, decent work and equal pay; the eradication of forced labour and child labour; and the protection of labour rights and provision of safe and secure working environments. FSC’s Principle 2 is dedicated to workers’ rights and employment conditions. Specific criteria and indicators are included to ensure the application of the ILO’s core conventions, gender equality in the workplace, health and safety practices, ‘living’ wages, training, conflict resolution, workers’ engagement, and damage avoidance and compensation. • Principle 2: Workers Rights and Employment Conditions. The Organization shall maintain or enhance the social and economic wellbeing of workers.